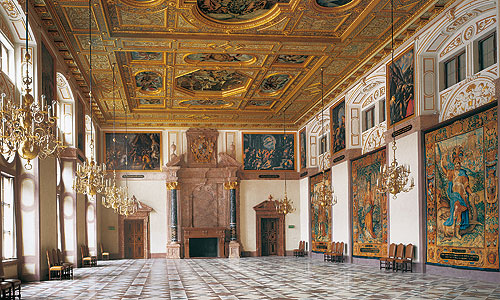 The state rooms in the early Baroque Residence created under Maximilian I were reached via the Imperial Staircase, a wide, magnificently decorated flight of stairs in the north wing of the Imperial Courtyard that was completed in 1616 and featured numerous images glorifying the noble ancestors of the Wittelsbach dynasty. 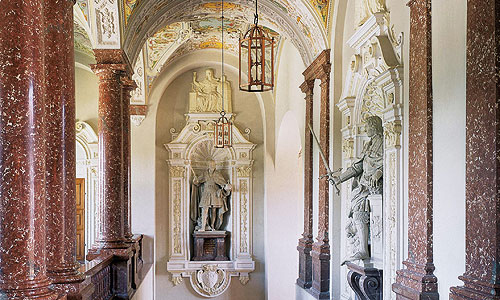 The Imperial Staircase opens into the vestibule of the Imperial Hall, which was also built under Maximilian I at the beginning of the 17th century and in this period was the largest and most important room in the Residence for festivities and a place of utmost ceremonial importance. The theme of its elaborate picture programme is princely rule based on reason and virtue. The tapestries by the Dutch weaver Hans van der Biest thus depict heroic figures from classical antiquity and the Old Testament, on which the ruler should model himself. 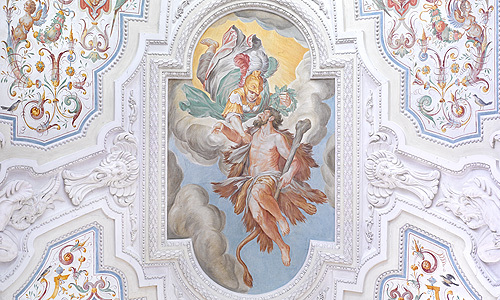 The cycle of paintings in the frieze above also shows episodes from ancient history and the Bible that were taken in the 17th century as examples of virtuous behaviour. 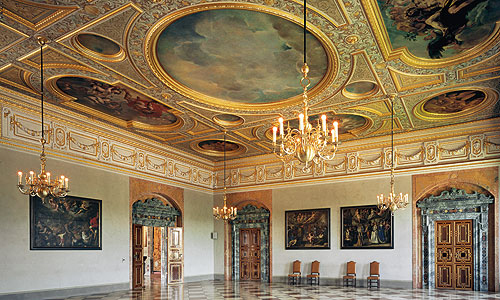 The idea of princely virtue is continued on the ceiling in an extensive cycle of pictures created by Peter Candid and his workshop: the figures in the three main paintings symbolize sovereignty, wisdom and fame, without which virtue is incomplete. These three paintings were destroyed by fire in the war and have been replaced by reproductions. This moralizing picture programme in the Imperial Hall originally culminated in a statue of Virtue that stood on the mantelpiece. The Four White Horses Hall on the west side of the Imperial Hall was built in 1614. 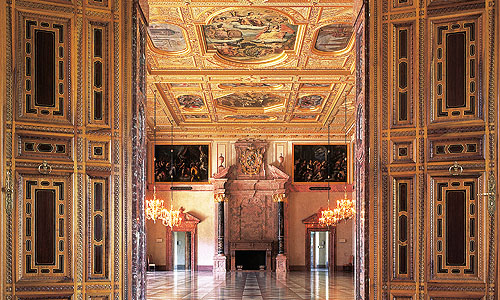 It originally served as the anteroom of the adjacent Stone Rooms, the apartment reserved for the emperor when he stayed in the Munich Residence. On such occasions the important visitor took his meals in the Four White Horses Hall with the highest-ranking members of his court. 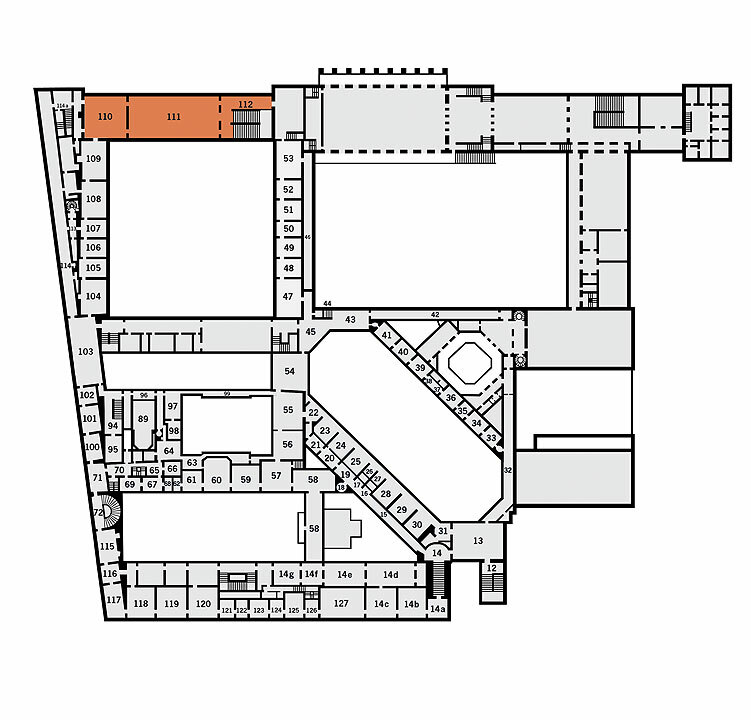 The hall takes its name from a painting no longer in existence in the centre of the ceiling showing Apollo in his sun chariot drawn by four white horses. Surrounding this picture dedicated to the sun were six paintings featuring the planets that had been identified by this period in the form of various gods. In 1799, the early Baroque Imperial and Four White Horses Halls were replaced by neoclassical apartments for Max I Joseph and his wife Karoline von Baden. When these so-called "older Court Garden Rooms" were in turn destroyed in 1944, the two lost 17th-century festival halls were reconstructed on the basis of drawings and descriptions and furnished with the original paintings and tapestries that had been preserved. The reconstruction work was completed in 1985.